Pénélope is back on Chapter 13 Page 29, and she’s a bit different than before. This is the form of her choosing. 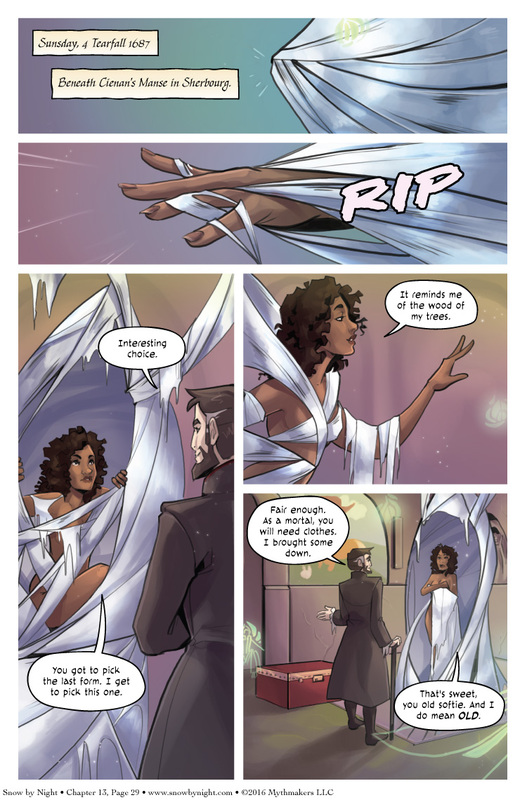 You can see her fetching new outfit when you vote for Snow by Night on Top Web Comics. Steph and I will be attending Baltimore Comic Con next week. I haven’t attended this show in a few years, so I’m really looking forward to it! Take your time, no need to hurry with the clothes! Old man? Does that make him a dirty old man by default then? Why is she so interested in walking among humans? I’d like to know more about “Penelope”, her backstory and motivations. Very interesting form indeed especially since it won’t be common for the area. My curiosity is piqued if all his maids have been spirits he has given human form too. I wonder if they weren’t all just the same maid changing forms. “And I do mean *old*”…? I’m beginning to wonder if Cienan is a normal mortal himself. Now that you mention it, that does seem like a hint that he’s more than just a conniving, wealthy mortal. Frankly, I prefer him as a “mere” conniving, wealthy mortal, like Lex Luthor or David Xanatos. An extraordinary man who throught guile, money and determination can play against gods feels more inspiring than another god in disguise. I agree, Dargor. Although, with his skills at making deals, Immortality might very well have been one of the perks he swindled from someone. DLKMusic: That would be so cool! I don’t know about “god in disguise.” Another spirit? Maybe. But I’m leaning more towards “acquired the secret of immortality (or near-immortality),” like others here suggest. If that is the case, I have a couple ideas on how that came about, but I almost don’t want to post them & ruin any future revelations, if I’m correct. What, he could be a 400 year old Celtic-equivalent wizard. That’s technically mortal. Oh gez now all I can picture is him saying you shall not pass, without getting decent! Ugh….